Since a reader here suggested long ago that I read Suzanne Collins’ first series of books, the five Gregor the Overlander novels, The Underland Chronicles, for a better idea of what she is up to as a writer in Hunger Games, this has been on my to-do list. I finished the fifth book, Gregor and the Code of the Claw, last night and offer these three good reasons for you to purchase the five books today and begin reading them. (1) The series is never, ever going to be made into movies. It’s books or nothing, folks. (2) The Chronicles open up the core meaning of Hunger Games and the evolution of Collins’ artistry. (3) They are page-turning, heart-engaging, “O, brave New World!” adventure yarns you will love. In other words, “If you love Harry Potter and The Hunger Games, then….” For what are pretty much spoiler-free explanations of the three reasons, jump the jump. (1) It’s never, ever going to be made into a movie. I like movies as much as the next guy, if I struggle to take them seriously as art. I am very grateful, of course, for the Potter, Twilight, and Hunger Games movie franchises because they bring in millions of readers who pick up the novels after seeing the film version, even if that adaptation is a far, far cry from the original story. But Gregor the Overlander isn’t coming to theatres near you ever. If Hunger Games is bigger than Citizen Kane, Gone With the Wind, and all seven, um, eight Harry Potter films combined, the biggest adaptation you’re going to see of these stories is a BBC radio production. And that’s a stretch. Why am I so confident this is a ‘page only’ story experience? It’s the only book to break the lovable cockroach, rodent, and bat barrier. It’s as if the vermin of Brian Jacques Redwall books take over the storytelling — Cluny the Bard. Really, if you cringe at the thought of a really big bug and rats and bats are the stuff of your nightmares, this is going to be a wild stretch for you even to read — and just imagine it on the big screen! Rats as large as human beings, bugs like buses that adore, surround, and insist on playing with human kiddies, and bats as your best friends, also all as big as human beings. Willard wouldn’t make it as a coming of age film. Gregor ain’t making it as a film. It takes place in the dark. I don’t care how adventurous a film-maker is, a movie that is lit mainly by torches and experienced in the end by echolocation is not going to get the money for CGI it needs. Imagine for a moment sitting in a dark theatre for two hours watching a dark screen about vast dark spaces you can only imagine. The Story features a 3 year old Heroine. ‘Boots’ is a winning character and a really important part of the show. There is no way, shy of a fully animated film, you’re going to find an actress that can play the part convincingly. Collins captures the cute spontaneity, naivete, unconditional love, and maddening selfishness of a precocious infant better than any story teller I can remember. This success, however, makes a movie adaptation of the books in which Boots is central that much more unlikely. The figurative darkness is as profound as the literal black-out. Because you’re a Hunger Games reader, you know that Suzanne Collins isn’t bashful about interjecting a little violence into her stories. Y’know, children thinking of creative ways to kill other children so adults can watch the murders on teevee? That sort of thing. Well, as hard as the dystopian stories will be to bring to the movies without a NR-17 rating or worse, Gregor trumps that. 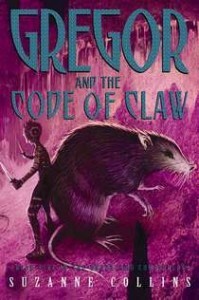 Human beings fighting with much-larger-than-life rats, a feature of each novel, and graphic death handed out by 12 year olds wrapped up in a story that explores in not very subtle allegories the Holocaust, the destruction of Native American civilization, and the Israel-Palestinian divide is not a Hollywood hot property. It won’t make it as a film, then, which is really unfortunate. Because these books make great reading. No joke. (2) It opens up the core meaning of Hunger Games and the evolution of Collins’ core artistry. Are the Underland Chronicles just Potter knock-offs? 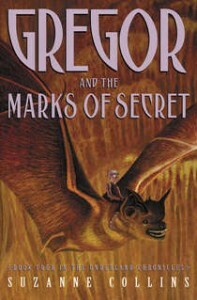 Hardly, but, as they were published by Scholastic in 2003 at the height of Harry Hysteria (to be distinguished from the earlier age of the mania, the witchcraft focused Potter Panic) by a first time novelist, you’d have to be blind not to catch the common ground shared by Gregor and Harry. They’re not twins or mirror reflections but the family resemblance is more than striking. Each is in his twelfth year. Both have difficult home lives and sleep in very tight spaces. The boys discover a world within the surface world that they accepted as the only reality — and, mirabile dictu, they discover that in this world they have remarkable powers neither had in his mundane life and that they have messianic or world-saving destinies that people are very much aware of in their other world. 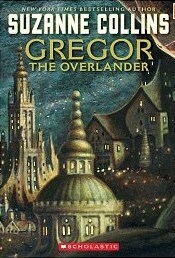 Gregor goes back and forth between the Over and Underlands between adventures. He is drawn back into his other life repeatedly and has a hero journey, complete with an acquired-at-near-loss-of-life lesson won in combat with self and scary foe. The story is told from right over this guy’s shoulder, that’s right, 3rd person limited omniscient. You’ll recognize the perspective, I’m sure. A Prophecy! It’s About Choice! Down with the Metanarrative! 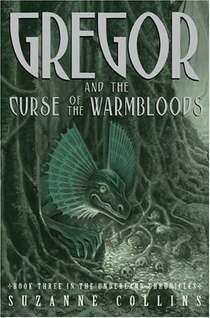 Four of the five stories feature an ancient Prophecy featuring Gregor as “the Warrior” and the struggle in each of these adventures is to figure out what the obscure prophecy really means. This resembles the Harry Potter prophecy in its working out eventually into a celebration of personal choice over fated destiny as per core postmodern beliefs. Collins works it at a different angle, though, in ultimately, I think, turning it into a picture of the reader’s experience and understanding of the text each of us has entered. just as Gregor has to work out his right relationship with the poetic destiny that is shy on specifics by making the heroic, sacrificial choice (Hey, does this boy have a “saving people thing”? You betcha). Especially in the series finale, the author tips her hand via the smart character, Ripred the Rat, and his confessing what he thinks of the prophecies and how to live with them. Hint: It’s a metanarrative thing, maybe even an attack on religious belief, though it seems more like “conventional thinking.” Postmodernism 101: Don’t believe what you think, Self-Actualize though Choice, and, always, Speak Truth to Power. All five books are three parts, nine chapters per part, twenty seven chapters total. It’s the Collins’ three cubed three act signature. This requires a more careful reading than I gave the books on my first pass, obviously, but the shocking nigredo revelation typically was followed by floods or sea journey, with a climax of fire in the later books. It bears a close look with the alchemical glasses on. Boots’ real name is ‘Margaret,’ which means ‘Pearl’ and she is the love of the book, what keeps the hero on the straight and selfless narrow. The big bad rat, too, is all white and, though called “the Bane,” has the real name of Pearlpelt. Collins didn’t start her pearl fascination with Peeta, Katniss, and company. The inner light symbolism, too, is concurrent with this imagery. Life to the Underlanders is called “light” and the Queen to be in the boks and Gregor’s love interest is named ‘Luxa.” Not especially subtle, Margaret and Luxa, but the light shining in the darkness and Dantesque story structure deliver the Cave Allegory meaning much like Hunger Games. The books are bloody and unsparing in their depiction of the cost of battle. Four of the twelve adventurers in the first book die, as predicted in the relevant Prophecy and you get an up close experience of each with suitable grief and shock on the other battlers’ part. Which brings us to the big message of the Gregor Saga: wars are horrible horrible things in which everyone loses profoundly by necessity, no one is fully justified, and the folks calling the shots are crooked, nasty folks. And yet, wars must be fought because thee is evil in the world that must be confronted and relative and absolute goods that must be protected. And yet, the consequences of war are inevitably shattered lives and persons who are never quite right afterwards. Sound familiar? Gregor ends on a more upbeat note than Games does in Mockingjay’s Meadow but the anti-war, “war is hell,” and pro-soldier and pro-Principle anthems, the multi-faceted and anything but simple depictions of life in war time that Collins presents in her first five books is only different in delivery and impact in Panem. It’s the same pitch. Western Union couldn’t deliver the message the way Collins does. They came out during Potter Mania, 2003-2008, and we were busy reading other big books from Scholastic. Really, their covers are not professional, Warmbloods being an exception, and there aren’t any chapter illustrations. If you want Potter popularity, it wouldn’t hurt to throw in some pictures. Then again, pictures of bats, rats, and cockroaches? Maybe just work on the covers. I loved the Underland but all the supersized creatures know the way out to the Overland — and none of them ever takes it. Given the mayhem and species cleansing there by germ warfare, intentional famine, and systematic attack and extermination, that fails the believability test. We’re just not given sufficient reason to buy into this world way beneath our world never bleeding into our world. And you could make a movie out of that, if Boots has aged a few years! A big part of Harry and Katniss’ ‘wow’ effect on readers is their being the heart or soul of a three character triptych representing the body-mind–spirit aspects of the human person, Ron-Hermione-Harry, Gale-Katniss-Peeta. We don’t get this soul projection-board in the lead figures of the Underland Chronicles and there just isn’t the same depth of engagement, identification really, in these books. We have a great love story with Gregor and Luxa and you could rate Ripred as the body or the mind, but if we call this body-will-spirit, it has the feel of forcing the pieces. There’s no Jacob-Bella-Edward tension here, no Quarreling Couple per se that leaps out at you. Collins discovery of the power of the Lead Trio and Soul Triptych is the biggest step up in her story telling in Games. Your comments and corrections, please! Please put a Spoiler Alert over your two bits if you want to comment or ask a question about a specific book or the series plot point non-readers won’t know. Well, the name is Gregor and the Prophecy of the Overland, and (hopefully) Amazon Worlds will add more series to it so I can put this book up. And I think the only key difference in this book is that Boots isn’t along for the ride this time. Other than that, I’m trying to keep everything that made the book great. One of the things i love most about this series is its depth. It addresses key themes and issues concerning politics and war and violence. Collins dosent spare you the blood and isnt afraid to kill her darlings which i found concerning at first because she kept killing off my favotite characters. The end left me devastated because it was a very Brave way to end a series. She leaves you just enough information for there to be an actual end, and just enough questions that you curl up into a ball in shock and cry and demand another book to follow and fill the hole she left inside you. She also makes you care enough about rats and spiders and bats and roaches to cry over them when they die. Ripred was one of my favotites and the way they portrayed the relationship between the humans and the bats pleased me to No end. But i also believe that with enough money, a movie would be possible but i doubt this will ever happen to the extent that a movie would fail the watchers when they tried to be cheap about it. Aimed at a younger audience or not, this series addresses topics that even adults would benifit from. Satisfyingly gory. Inspiringly well plotted and a pleasure to read. Suzanne collins let me just say I love the gregor sieres better than the hunger games i personaly think but i was pretty upset with the end well i wanted more because i think there can be more. 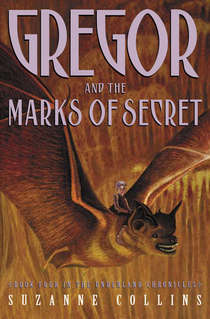 so i was thinking that gregor was tierd of the overland and gregors family still live i new york because his grandma is still ver ill and eventually he cant take so he is about 16 and he is trying to go back to the under land so at a certain tike he sneaks out and goes to the underland but he must go threw the water way and that iswhen he finds out all of the crazy things that are going on so i think that the problem this time since you kin of left it off with the cutters are back to kill the humanes and the humanes where able to maintain ther alliance and thatwere you would come in because if this story were to be written i wouldn’ want to spoil the rest but hopefuly all the main charecters .are still ther like howard luxa mareth nike aurora vikus maybe and ripred so they still need the “warrior” one last time to help fend off the cutters (ants) so they reforge his broke sword when the leave the decision up to there and so if you would like to make another book or two with this idea i would really like it. if you have any questionst or to tell me that you will consider making another book. I’m 17. I’ve read the series about 5 times now, my first time being in middle school. Every time, I become riveted to it, knowing what’s coming, but I still feel every emotion equally strongly every single time. When I near the end of the series, I know that the watery, open-ended conclusion is coming. I read the last line, and I just feel deflated and depressed when I realize that’s it. I would be elated if Collins would even write a time-lapsed epilogue. Did Gregor and his family move to Virginia? Did his parents realize, when Lizzie said she didn’t want to go anymore, that their proverbial roots were too deep to go anywhere without hurting one or more family members? I need closure. It kills me not knowing. This may just be me as I’m an extremely empathetic reader, but hey, it’s how I feel. Although I’m not 17 (67), I thoroughly agree with Chris’s comments. When I first read the series last year, I was disappointed with what I perceived to be an unsatisfactory end to the story. Even a short epilogue would have been helpful. However, the series is still worth reading – over and over. I wonder if Ms Collins isn’t tempted to write another Gregor story. Her Hunger Games success would mean that it would be a guaranteed best seller — and, if it were a sequel, readers would feel compelled to read the series they missed. Major payday, yes, but also readers for books that deserve a much larger audience. My 9 year old nephew just got a Kindle for Christmas, We gave him this series plus L’Engle’s A Wrinkle In Time. Some of the best children’s fantasy I know. I, too, found the ending somewhat dissappointing, but at the same time it’s amazing. 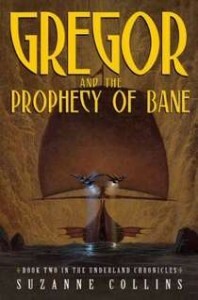 Sure, nobody really likes cliffhangers, especially at the end of the story(or, in this case, when the hero gets the girl), but this one allows readers to end it however they want(using their imagination or writing a fan fiction) thereby giving us the option of visualizing Gregor going back to the Underland to return to Luxa. My grandson is a fourth grader and he brought the first book in the Underland series home toward the end of third grade. He reads aloud to me almost every day. I have never before enjoyed fantasy so I was so surprised at this story. I was sucked in and can’t wait to read each day. We are on book 5 and half done with it. Neither of us want it to end. We bought him the whole series to have and re-read. I credit these books for his advanced reading ability and love of reading. It is an experience I will treasure forever. I am 65–he is 9. Highly recommended. I am dying to know the ending. This article made several good reasons not to make the Underland Chronicles into a movie, but I can’t help but feel this would be a great, animated film. I really enjoyed your review and I thought you summarized the book quite well. Something you didn’t mention ,however, is that whole Ripred-Haymitch comparison. If feel like when Suzanne Collins was writing The Hunger Games, she needed her Ripred counterpart. I got into the underland books over Christmas, and it made my list of all time favorite books. Better than hunger games. I cannot stop reading the books over and over. I was disappointed by the lack of closure at the end, but it leaves room for a new book. People said the same things about the Hobbit and LOTR, that it could never be a movie and what do we have now? I know of 2 studios at least discussing and beginning discussion of acquiring the movie rights. It will be a movie if not a series, especially after the success of The Hunger Games. I love your post, it is EXACTLY the intelligent take on the series that I wanted after finishing it for,what, the 5th time? The thing is, I really,really, really want a movie made out of these books. I agree with everything that you said about how hard it would be to film. But let’s face it, Collins is NOT going to write a 6th book. Seriously, it’s been 7 years. And unless she is way over the Hunger Games mania and is like ” Oh man I’m so tired of this I’m going to go back to an older series I wrote ages ago but that I’m just as fond of….” Which I highly doubt. It’s not gonna happen. But, Collins is now ridiculously famous. The Hunger Games are right up with Harry Potter, apparently-I haven’t read them yet, I’m fifteen but I’m saving the experience for later- if anybody had even the remotest inclination to turn this series into a movie experience, it would happen. They’d overcome all the limitations. They would, just because it has Collin’s name on it. In my mind it’s only a matter of time before someone in Hollywood realizes that with this series they could strike the jackpot. It’s just too good of an opportunity to pass up…I hope. This is a great series, and I really hope that it will be made into a movie franchise, as it is truly too good to pass up. I also really hope that Suzanne Collins will write another book or another followup series, perhaps in the future and what has happened to the underworld? I liked this series more than the Hunger Games, and really hope for more, whether it be movie, book, or even just an epilogue. I’ve been tossing it back and forth for a long time whether or not a movie could happen… I like this series much better than the Hunger Games, not that that one wasn’t good, but Gregor’s world is more unique and original in my mind. I’m 30 now, I read them all years ago but now I’m reading them to my son. He’s 5, so I have to leave out SOME of the particularly gory parts, but he’s really invested in it too. Second time around still brings tears when certain things happen. There are plenty of movies or TV shows that can get away with “implying” darkness while still being lit up enough for the audience to see what’s going on. Nobody’s ever cast as young as the characters in a book. Look what they did to Ender’s Game…no wait, don’t waste your time. That was a travesty. Which is why I’m so on the fence about whether I’d even want to see Gregor on the big screen…but I do agree with the few comments that suggested it may happen just because Collins is a big name now. And even if it sucked, I’d still go see every single one of them. I have just finished reading the five book series nonstop. While I am sure that my views will change, what amazed me was the consistent voices and the multiple layers of meaning that Suzanne Collins built underneath the surface of this young hero story. The first layer is the struggle between being a warrior and peacemaker. This struggle ran through the entire book. The second is the difficulties to see onself and how it often takes seeing yourself through a person’s eyes or even through a camera’s eye, as in the case of Gregor’s struggles to realize that his feelings for Luxa. The third is the two-way love of parent and child and how loss of this love is so devastating. However good a series this is, I know that I don’t want it to be a movie. One, for the reasons already listed above, and two, they will butcher it beyond recognition and swap out Gregor and Luxa for twenty year olds. There’s also a reason why she wrote it like that. It shows exactly how much they all have grown. A perfect ending, one with closure, one that makes us readers feel so warm and fuzzy inside, will ultimately be the ruin of the series. Never fear, though. I know for sure, even if the rest of Gregor’s adventures remain undocumented, he will grow up, out of our sight. When he is twenty or so, he will come back to the city. And he will go to the Waterway, in the chance that a flier will be waiting for him. The rest is up to your imagination. Maybe not as a movie, but it would make a good anime. In anime format, it could work. And if I were in charge, I’d make sure it stayed true to its source material without any fillers unless they were actual events in the books. I’m a big fan of the Underland Chronicles and, until I read this, I was always wondering why a movie was never made. However, all the points you’ve made make perfect sense and I can admit that a movie based on the books would probably be a bad idea. Luxa was my favorite charachter she is strong .It was my favorite series i dont read but i read this there is so much action. Dear John. Er – just wanted to show you this, re your first emphatic statement in this blog…. They’ll make a film of anything these days! Of course Gregor can be made into a movie. What you’re trying to say is they won’t make it into a movie that you, personally, would approve of. Not a single point you have made has EVER stopped the filming industry from filming anything. Wow, the film followed the story exactly! (said no one ever.) They’ll figure out a way to make Boots fit, make the bug/rat/bat thing work. Plot holes will keep a movie from being made? You really need to get out more. There is one and only one reason a movie won’t get made – because no one thinks it will make money. Period. The only exception are films that are self-financed, (and those carry an adjenda.) I that’s not to say they’re bad, – a lot of them are excellent, but they’re not made for the mass market. It’s about time I do that again. I really hope they make a movie or at least continue the series (Which probably wont happen)…………………………………………..